This Quick Ratio steering gear box is brand-new, not rebuilt—no core required. 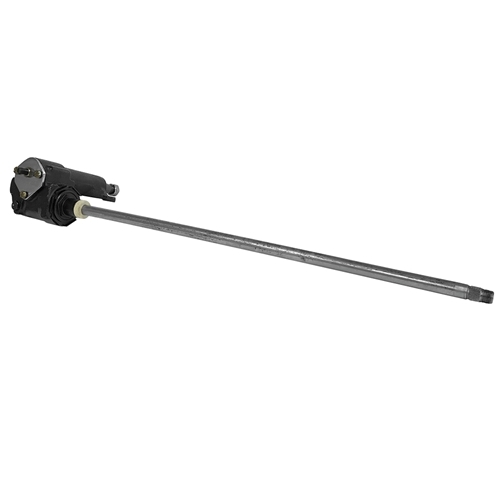 This 16:1 ratio box is 3.75 turns lock-to-lock, greatly improving response, performance, and drivability over the original 20:1 ratio box (which is almost 5 turns lock-to-lock); and it features a correct 1-piece 39" input shaft and 1" sector shaft. Please verify your sector shaft diameter before ordering; if you have a 1-1/8" diameter sector shaft, see part number C4DZ-3504B. C4DZ-3504A replaces boxes with tags numbers HCC-AM and HCC-AN. NOTE: Manual steering cars will require more effort when parking compared to 20:1 ratio.